Unique and eyecatching! 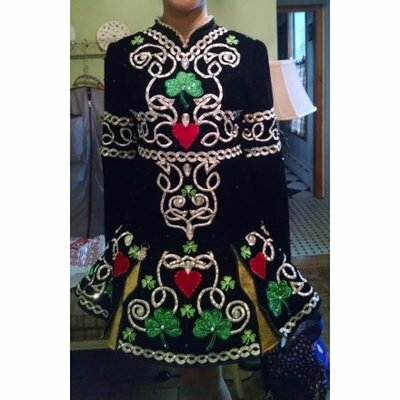 Lively white knotwork on rich black velvet plus red velvet hearts and green sequin shamrocks galore. Gold sequin panels in stiff skirt with a red tulle underskirt for more flair. Jet stones on black velvet, red stones on hearts, AB crystals on knotwork. My daughter received lots of compliments in this dress. Sad to part with it but must sell due to growth spurt. Dress has been let out in the torso but can be taken in. Comes with red bloomers, red flower hair pin and extra sequins/stones. Dress has been let out in the torso but can be taken back in. Asking Price: $400. Shipping costs are included for my own country, overseas shipping is extra. Will accept returns and refund the cost of the dress, buyer to pay all shipping costs.